You are currently browsing the tag archive for the ‘aggregators’ tag. News stories glue portfolio managers and analysts to their screens. Each story feeds into a positive or negative bias. What if I could automate that? What if I could read everything as it comes out and sort it according to positive and negative news for a company? I could react systematically, quickly and across more stocks. I might even replace the role of the analyst. Machine-readable news starts with exactly this economic intuition. The plaintiffs’ claim against the defendant for ‘hot news’ misappropriation of the plaintiff financial firms’ recommendations to clients and prospective clients as to trading in corporate securities is preempted by federal copyright law. We conclude that in this case, a firm’s ability to make news — by issuing a recommendation that is likely to affect the market price of a security — does not give rise to a right for it to control who breaks that news and how. —Robert Sack, U.S. Circuit Judge, writing in the joint opinion of a three judge panel, via Bloomberg. The opinion does not impact Judge Cote’s findings of copyright violations by Flyonthewall, it does undermine New York’s hot news doctrine and the enduring notion of property rights for the news. There was a time when daily prices for US Treasuries were hand-written on two or three sheets of paper from a yellow legal-pad and run by messenger to the Associated Press and Dow Jones. The AP needed the prices early enough to send to their members and Dow Jones was under pressure to make the deadline for the Wall Street Journal and their newswire. The messenger couldn’t wait for the closing prices. They had deadlines. No. A clerk would scribble the list furiously and send it off – smudges and all. Bloomberg called it the modern day pony express. It wasn’t far off. Some poor runner would bolt into the respective newsrooms, hand over a precious few sheets of paper, and watch the operator enter the prices into their system. But in 1987, Bloomberg would change that. Bloomberg’s terminals had found a quiet niche in the aggregation and analysis of Treasury pricing data. It had so much data that it had beat the Fed. Bloomberg had better, more up to date data than the Federal Reserve. It’s prices were more reliable than the Federal Reserve. What followed was perhaps one of the finest coups of earned media in history. Rather than rely on legal pads and couriers, why not wires? Why not a Bloomberg terminal? The AP and Dow Jones each took at terminal. They got better data. They got closing prices. And each day, they ran a full page of Treasury prices, courtesy of the terminal and credited to Bloomberg. Lesson learned: if you want media, earn it. The facts do not owe their origin to an act of authorship. But does the hunt, the research, the interviews? Or perhaps its organization into a story for the dissemination to a reading public? And can these be made exclusive? These questions have bubbled up as the newspaper industry wrestles with what the internet is doing to their business. Copyright law sufficed to protect the written word, fixed in a medium, but these claims demand remedy for a larger issue. They aim to protect the investment required to collect the facts and write a story, when it might easily be re-written and distributed by another. But they ask for monopoly control of the story itself — indeed, ownership of the collection of facts and ideas that might make up a breaking story on government corruption, for example. Justice O’Connor, however, finishes with little support for these views: “The distinction is between one of creation and one of discovery.” And discovery is not subject to property rights. One imagines the libraries and retirements encircling prized volumes. Access is limited. The doors are closed on hushed, dark rooms, and rude custodians may or may not respond to the knocks of visitors. The lively entertainments of the mind, pressed flat and laid up in shelves, are collected — excluded from the general population. Mr. Spectator lights up these entertainments, unbinds them from their pages, and sends them around the room and into society. He obtrudes them upon the public. The pseudonymous Mr. Spectator offers a voice that would direct many of the discussions of the day, through education and entertainment, in 18th Century London. His daily issue, launched and written by Joseph Addison and Richard Steele 1711, would be called The Spectator. Addison & Steele’s Spectator boasted a distribution of 3000, through hawkers and mercuries, and a readership upwards of 40,000: “every page submitted to the Tast of forty or fifty thousand Readers” [No.508]. But the finances were unclear and, at best, shaky. The paper, which paused mid-stream for a substantial hiatus, only lasted just over six hundred issues. The optimism is palpable, but the rewards were not. The nascent newspaper was more likely to lose money than make anyone rich. More often than not, publishers struggled to make the business work while slowly draining their investors. The Spectator was among an exceptional few to survive the tax increase of the Stamp Act. Their story, however, is surprisingly similar to what we see in today’s shift to digital media. What Addison & Steele and others discovered was mass media, a new media in its own right. Then as now, their efforts derived from changes in regulation and technology and competed with the traditional forum for news – the pulpit then, and newspapers today, for example. The competition among dailies divided the public into publics, each driven by the tastes and temperaments of its readers. These early dailies changed the public’s relationship to knowledge and brought it out of libraries and retirements in the same way that today’s new media brings news out of the newspapers, for example, and generally enlarges the free-marketplace of ideas. Addison & Steele’s budding media empire flourished when placed in the hands of the audience. Today’s newspapers and magazines would have you believe the same, but it’s distinguished in one key way. It has built up a dependence on paid circulation. This was less important than one might think for those early publications. Instead, they relied on reputation and influence at first, followed by advertising. Paid circulation was, in effect, a manner of subsidizing distribution. Mass media’s origins in 18th century newspapers began with two developments. The speed of the printing press introduced the possibility of the daily — something unthinkable in the age of scriptoriums. The status of the written word would shift from scarcity to abundance. The dearness of a volume, which had been measured by the many hours and men required to copy it, was rapidly sliding toward the price of the paper on which it was printed. 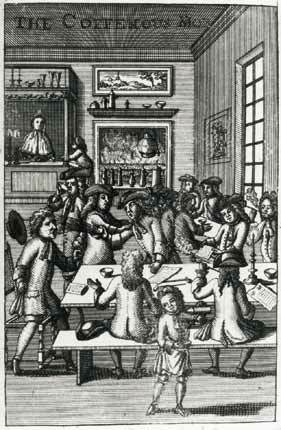 Second, with the lapse of the Licensing Act in 1695, prepublication censorship ceased. Print would emerge everywhere and could include anything. Many would publish not only the inventions of the moment, they would uncover and disseminate the knowledge from those libraries and retirements — all for not much more than the price of the paper itself. Early newspapers would supplant the pulpit and occupy an advanced position on both book publishing and the congregation. The pulpit provided the equivalent of a weekly news show. Congregations received the news once a week in a format and fashion that was faster and easier to consume than books. As Elizabeth Eisenstein observes in The Printing Press as an Agent of Change, “before the advent of printing, events of significance, when reported at all, were usually conveyed from the pulpit” [p. 553]. The sermon might address world events, local trade, real estate transactions, and politics. The newspaper, however, would insert itself in the daily routine of many: “the pulpit was ultimately displaced by the periodical press” [p. 131]. If changes in regulation and technology leading up to the 18th century fostered the sudden supply of publications, what drove the need? The demand for publications such as the Tatler, the Spectator, the Craftsman, the London Daily Post emerged as a genie from a bottle. The public wanted newspapers. They wanted something different than the weekly lessons and announcements from the pulpit. Eisenstein remarks, “the dictum ‘nothing sacred’ came to characterize the journalist’s career” [p. 131]: it wasn’t the church. Instead, among the teeming dailies, one could choose the the right one for one’s self. Dailies didn’t just discover an interested public, they discovered interested publics, each with their own tastes and preferences. Addison & Steele’s ambition to serve a reading public changes society’s relationship to knowledge. Knowledge would no longer be exclusive. Obtruded upon the publick, it would reach into new corners of society to be consumed, critiqued, and engaged. Addison & Steele’s Mr. Spectator would write in Spectator no. 10, “I have brought philosophy out of closets and libraries, schools and colleges, to dwell in clubs and assemblies, at tea-tables and in coffee-houses.” The Spectator would be one of many vehicles for this change, and distribution would drive it to thousands in 18th century London. The Spectator would mine the libraries, his competitors, and the conversations at the coffee-houses for the facts and ideas behind each missive. The collected ore would only be valuable inasmuch as it would capture the attention of his readers. With the diversity and detail of the web, today’s contributors mine newspapers, magazines, books, official announcements, and just about anything they can get their hands on. One might characterize these as transactions in the free marketplace of ideas, but then as now, they sparked controversy. Just as the pulpit may have been upset with the rise of the newspaper, traditional media finds itself frustrated by the thousand-fold rehashing and reinvention of the facts and ideas that had once seemingly been their province alone. Today’s changes in technology and a mindset rooted in net-neutrality and open systems have yielded similar innovations. The internet, blogs, and increasingly creative media ventures that have become substitutes and complements to traditional media. Both moments yielded an efflorescence of expression that was fertilized by rapidly diminished costs and threatened to supplant existing institutions: the congregation and traditional media. And both moments relied on the ability to rehash and reinvent the accumulated knowledge of their time to fill their pages, virtual or otherwise. The resulting fragmentation of readers would replay many of the changes ushered in with the the early 18th century dailies. Could these early publishers charge for this? Barely. What would matter for Addison & Steele and their counterparts today was the audience, and their success would not be measured in how much people paid for the content, but in the reputation they developed and the ability to advance the interests of the proprietor and their investors. The Spectator built Addison’s reputation. He wasn’t concerned that his readership far exceeded the paid circulation by more than ten-fold: the more, the better. His reputation among them would provide other opportunities. The Spectator, after all, was his second publication. It followed the Tatler, and it was his reputation that enabled him to do both. Later, he would harvest these efforts through the sale of bound volumes of each. We see something similar with blogs such as Joel on Software, which was later published as a series of books. Combined, the blog and books undergird his company’s credibility as a leading software developer, which has led to ventures such as Stack Overflow. Meanwhile, Brad Setser’s consistently trenchant, though not always well edited, observations on currency flows from the Council on Foreign Relations ultimately led him to a position in the White House, and Julie Powell’s musings on Julia Child morphed into a book deal, a movie, personal complications, followed by another book deal. Investors in early newspapers sought influence and profits through circulation. More often than not, they may have found influence, but not the profits. The paper, however, was well-suited to advancing their individual interests. They may have been merchants or theater owners, so they would use their position to obtain better advertising rates, coverage or otherwise. Michael Harris, in London Newspapers in the Age of Walpole, remarks: “the efficacy of the papers as vehicles for house advertisements could more than offset a limited return.” In these cases, the newspaper is an agent for the partners’ agenda: providing owners a venue to advertise their establishments. Fred Wilson’s blog has slowly impressed him upon the New York venture community in a way that uniquely positions his venture capital firm among investors and entrepreneurs. Michael Arrington’s thriving conference business owes its origin to Techcrunch. Barry Ritholtz has leveraged The Big Picture to cultivate an asset management business. The reputations in each of these examples drive a venture-investment business, a conference business, and an asset management firm. Addison & Steele’s were early days in the newspaper business. They and others managed to advance the reputation and interests of themselves and their investors. Soon, however, they would make a dramatic realization. If they could do it for themselves, they could certainly do it for others, and they would have a third leg on which to stand. Doing so would require a dramatic leap: they would have to sell the audience. They would invent advertising as we know it. Advertising started as the province of the proprietor and his investors. Advertisements were a privilege bundled with ownership – house advertisements. We see advertisements for booksellers, who may have been investors or close associates. But this would change. Just as blogs have been festooned with advertisements, early newspapers would realize that the audience might also be valuable beyond the proprietor and his investors. Advertisers began to include not just partners, but interested parties. Advertisements for soap or perfume joined those of the booksellers. Harris observes, “by the mid-1720s the amount of space devoted to this material was provoking some vigorous criticism.” By the mid-1720’s, early newspapers had meaningfully unbundled the privilege of advertising from ownership. For the first time, anyone who wanted an audience could access one. The audience became a service to be delivered:the newspaper, a the service provider. Early newspapers, like new media, flourish when they’re in the hands of an audience. They flourish when they enhance the reputation and influence of their proprietors and, through advertising, others — not because they’ve been charged for it, but because of the externalities that develop from an engaged, reading public. If that’s the case, should The Spectator have become a free publication and follow today’s flat dictum that information wants to be free? Addison & Steele never conceived of giving the Spectator away, but it’s worth wondering if they would today. They were thrilled to claim a total readership of more than ten times the paying readers, but would they give those paying readers up? Probably not. Addison & Steele’s circulation pattern provides an early example of versioning in information goods. Hal Varian explains versioning as a pricing method for information goods that sorts potential customers based on the quality of the good that they need. In Addison’s case, those who absolutely needed The Spectator would buy it on its first run. Those who could wait would pick up copies from friends or a table at Button’s coffee-house. Versioning, however, works differently today. The internet has no equivalent to picking up a newspaper from the table at Button’s or the floor of the subway. If there is, it’s in the form of passed links, aggregators, and comments and analysis that show up on blogs. But unlike with The Spectator, or even a paper copy of The New York Times, the chain generally does not begin with an initial sale. The first version is either free or behind a pay-wall: either available or not. It isn’t sold and read, only to be left on the coffee-house table. And if it’s behind a pay-wall, barring any individual indiscretions with copyright, there is no second version for someone to pick up. By analogy, it would mean Addison’s reliance on a readership of 3000, not 40,000. What would that do to his ability to monetize his following? It certainly would have impacted his influence. The consternation about pay-walls that has captured the current imagination is fundamentally a question about versioning. The New York Times and Newsday and others are looking for the digital equivalent to the table at Button’s coffee-house. What model will allow them to sell a first-version? The physical paper provided a solution, but the shift to digital does not invoke an obvious replacement. And a pay-wall risks severely limiting their audience and influence. Many online media ventures have avoided the issue entirely by offering one version, free of charge, to their audience. Passed links, blog-mentions, aggregators and others provide the digital equivalent of shared and found newspapers – the digital coffeehouse. Their influence can grow with the appeal and availability of their perspective. Considering half of the Spectator‘s circulation revenue went to the Stamp Tax, after the cost of printing and paper, there was very little left over for the owners, so there would be very little difference between being a free publication on the internet and a paid publication in print. An online Spectator would probably be a free Spectator: today’s raft of free blogs and new media ventures, its inheritors. The Spectator and early newspapers would evolve into the inky reams that we know today, but it turns out that they may be a closer cousin to today’s emerging media landscape. Both moments fostered marginal businesses that owed their origin to dramatic changes in technology and a change in regulation, in the case of the Licensing Act, and a mind-set, in the case of net-neutrality and open systems that dominates the web. Neither looked like any newspaper that we would recognize in the 20th century, but they would go on to change society’s relationship to knowledge and disrupt traditional sources of information, from the pulpit then to institutions such as modern newspapers now. Their economic success for lay in the ability to derive externalities from their audience in the form of reputation and, later, advertising. A bright line, however, still separates our modern print publications and the inheritors of The Spectator: the ability to version. The ability to version on the internet has proved difficult to incorporate and become a painful reminder of the many differences between print and the digital medium. What is the digital equivalent to the 18th century coffeehouse? Encouragingly, the New York Times recently answered with the announcement of its paywall strategy. If it’s passed to you, by twitter or a friend, please read it; otherwise, pay. You’re either a patron or a coffeehouse. Perhaps invoking the spirit of Addison and Steele will reinvigorate their prospects.